Every wedding dress starts with the fabric it is created from. With opulent silks and satins, to rustling taffeta and flowing chiffon, the possibilities in wedding fabrics is endless. Did you know that by simply varying the fabric of a wedding gown, the entire effect and feel of the dress is altered? This is because, there are many factors that the fabric of your gown determines—how the dress drapes, it’s pattern, cut and whether it is suitable for the venue and weather on your wedding day. 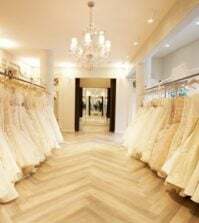 So, the textile you choose has a huge bearing on how you will look on your big day, and a basic knowledge of the different fabrics will help you choose your gown better. Let us take a quick look at the various fabrics that are used in the construction of wedding gowns, and the features that characterize each of them. To make it easier for you to understand, we have divided them into two categories: Soft flowing and Structured. Chiffon: Made from silk or silk-blends with manmade fibres, chiffon is sheer and soft. It drapes well, is transparent and a good choice for warm weather. Georgette: Made from polyester or silk, it resembles crepe but is very light weight. The material is not completely transparent, and its a good choice for summer. Tulle: This fabric resembles very fine net, it is stiffer than chiffon and adds volume to a gown. Tulle is crisp and see-through, it is the choice for wedding veils and is often mixed with other fabrics. Silk: Synonymous with luxury, silk adds an elegant and formal touch to any wedding gown. Available in different forms, from smooth mikado to charmeuse, silk wedding gowns are the epitome of style and sophistication. While raw silk is the textured type, other forms of silk are characterized by their sheen. Satin: Plain, lustrous and shiny, satin is luxurious and has a heavy structure. Duchess Satin and Larissa Satin are the two types used in wedding gowns, and it is an ideal choice for a formal wedding. However, the heavy structure would make it inappropriate for an outdoor wedding, but it is an ideal choice for cooler weather. Crepe: Lightweight and crinkly, crepe is a soft fabric that is created by blending silk and man-made fibres. It flows elegantly and softly hugs your body. It emphasizes your curves, as it has excellent drape. Taffeta: Characterized by the rustle it creates with movement, taffeta is made from silk or a silk-blend. The fabric has a glassy sheen and definite structure. It is often used in ballgown skirts and gowns that need to hold their structure and look poufy, rather than fall gently. Organza/Organdy: Two fabrics that sound similar but are different for the fact that while organza is made of silk, organdy is cotton. Both are crisp and sheer. Organza is popularly used in overlays and embellishments, and is stiff and can give structure to a gown. It resembles tulle, but is softer. This isn’t a comprehensive list as the fabric choices in wedding gowns continue to evolve and improve. Nevertheless, with this list in hand, you will be equipped to know whether you want a soft flowing, dreamy wedding dress or a structured and poufy bridal gown, and the fabrics that will work in this direction. For more wedding dress tips and advice, visit us on Best for Bride. Great tips! It is good to be able to learn about all of these things since I was not able to ask my mom for assistance while planning my wedding. Right now I am trying to decide which one I want to go with. These are good tips and things that I never considered! I have been looking at satin dresses all month. I have a few in mind, but am having a hard time choosing. Satin all the way. I just figured that it would be the most comfortable. I feel like I have seen a thousand dresses this month. I like the “structured” look that you have posted here. It just seems like it would fit my body perfectly.